I had never had this soup until last year when Brian and I moved and a lot changed in our lives, food was one of those things. We (me) no offense to Brian, he is super duper busy with school, needed to organize and plan a little better how our meals would be during the week. He is at school all day many days of the week, with little break time to eat between five classes, and a mountain of the homework he has to do, I had to get more creative so he could take food to school more often and never have to eat out. It is expensive and not as nutritious and delicious as what I can make at home. We started brainstorming for tasty, portable, friendly on the wallet meals. This is when I learned split pea and ham soup is his favorite. Now we have been together for four years coming up soon, you would think I would know this, but I did not. I have learned a lot about being in a long term relationship over the years with Brian, you will never stop learning about each other, if you do, well lets just say boring or communicate better. I know a lot about him, and I love those little things I do know, that is what can make a relationship special , but on the other hand it fun to learn more tid bits along the way. 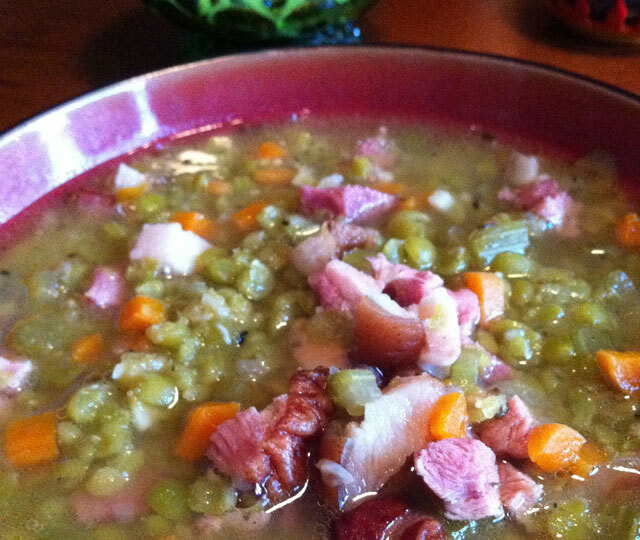 Keep it fresh, so split pea and ham soup is keepin it fresh for us right now, you can laugh out loud now, I totally just did, it is funny. No, really, not just soup, but for that day it was indeed soup. Over a few weeks I made it a few times to get the consistency right, and this is what I came up with. I hope you like it! Note: I found a butcher that smokes his own meat, I would recommend either finding one for you and you family, or go to a reputable store that would use the most natural ways of smoking. There is a lot of talk on nitrites out there, and from what I gather, going the most natural nitrite way is the best, also moderation, like with anything. Keep in mind there are nitrites in our veggies, so they are not all bad for us. For more on this subject if you interested, here is a brief article that Michael Ruhlman wrote called, The “No Nitrites Added” Hoax. The reason I mention these things is to broaden our awareness of the food we eat, and if I can point people in the right direction, I will. So back to the butcher, that is where I picked up a ham hock, at a great price, and smoked by him. I use the meat off the bone, so make sure to ask for one that has about 2-3 cups of meat you can get off of the bone. If not buy 1/2 lb. of extra ham. 1. In a large pot or dutch oven, heat the oil over medium heat, then add the onion. 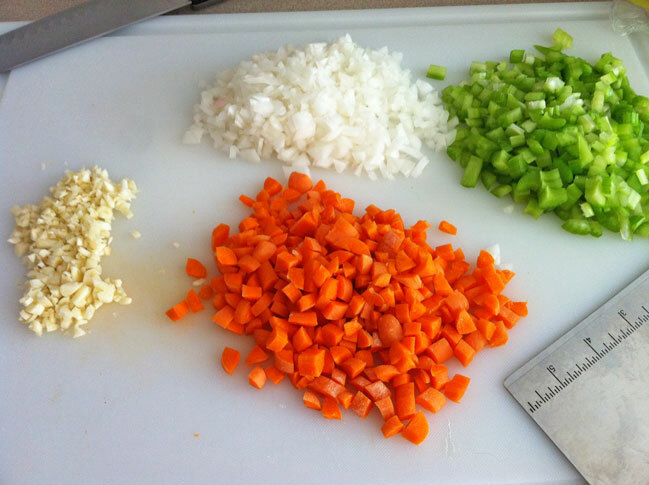 Sweat the onions for a five minutes over medium low heat ( no color), then add the carrots, cook for five minutes. Add the celery and cook for five minutes, then add the garlic and cook for three minutes. 2. Add the ham hock whole, stock, and peas. Bring to almost a boil, no boil though, then reduce to a simmer. Boiling peas will break them open and they become mushy. Add a large pinch of salt, freshly ground pepper, oregano, and cayenne pepper. We are seasoning as we go, as always. Cover and let simmer for about 45 minutes to an hour or until the peas are cooked. 3. After about 45 minutes, take the ham hock out, let it cool for a minute. As it cools, taste the soup for seasoning, does it need salt and pepper? If so, add now. Take a meat fork, or tongs, and start cutting the meat off the bone. Dice it up and return the meat and bones to the soup. Cook for 10 minutes, and it is ready to serve. You can finish it with cream, as many recipes do, but I like mine without.